My print copy of Transylvanian Adventures by Land of Phantoms has arrived (thanks for the great sale back in December, Lulu)! It looks good in the flesh and though I’ve had the PDF for a while now and it’s always nice to have a solid hardback to put on the shelf. I have given the game a couple of cursory reads and like what I see. With any luck I’ll actually get to do something with this… thing… in the nearish future. 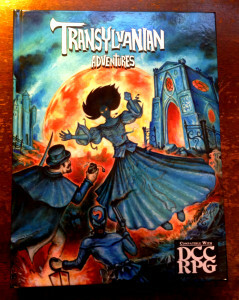 Oh, and in case you don’t know what the hell Transylvanian Adventures is (and can’t be arsed to click any of the links above) I’ll summarize it by saying that it’s the supplement you’ll want for Dungeon Crawl Classics if you’d like to take that system for a Hammer Horror-esque ride. There, that oughta whet your appetite. For blood. Ah-ah-ah-ahhhh! This entry was posted in Dungeon Crawl Classics, Transylvanian Adventures on January 6, 2014 by the venomous pao. Well, this looks cool. That was a nice little discussion about character mortality on the Land of Phantoms link, BTW. There was talk of a Hammeresque version of BoL, but I haven’t heard much about it lately. It’s definitely good stuff, G-Man. It (and DCC) are worth a look if you have the inclination and haven’t done so yet.